Interview with Tariq Aziz, Foreign Minister of Iraq. You will either be hit inside your house and destroyed, economically and militarily. Or you go outside and attack the enemy in one of his bases. We had to do that, we had no choice, we had no other choice. Iraq was designated by George Bush for destruction, with or without Kuwait. Inside Kuwait or outside Kuwait. Before the 2nd of August or after the 2nd of August. Q: In 1990, before the invasion of Kuwait where was Iraq heading? What were you trying to achieve? Aziz: We went through a very long and costly war with Iran, for eight years, and by the end of that war, all the Iraqis including the leadership were aspiring for a quiet life. 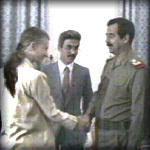 People in Iraq rejoiced the cease fire on the 8th of August 1988. The leadership was focusing domestically on rebuilding the country, those cities and towns which were destroyed during the war... improving the standard of living of the people of Iraq. Aziz: The army was huge during the war, it numbered around one million soldiers, but immediately after the war, we cut down almost to the half and even less than a half. By early 1990 our army was not larger than 350 or 400 thousand soldiers. We pushed very hard for Arab solidarity. So the policy of Iraq at that time, was a policy of responsibility in order to maintain peace, security in the region, in the Arab world, to strengthen Arab solidarity. Q: And to become an Arab super state? Aziz: No. That is the wrong perception about Iraq. What Iraq wanted to tell the Arab world is not that I am the leader of the Arab world. Iraq wanted to tell the Arab world that this is a model you can follow. A model of modern state, capable of defending itself and we succeeded in defending ourselves against a very very difficult and dangerous threat so we wanted to tell the Arabs, here we are, that's what we have achieved, look at it, if you like it, do the same. The fact that Iraq struggled to bring back Egypt to the Arab League, shows that we were not thinking of competition on leadership, because if you want to play that sort of a role in the Arab world, you would like to freeze Egypt, because Egypt is the biggest Arab country. Q: Was it your long term goal to crush Israel? Aziz: Honestly no. If you follow our policies in that period, first our concern about bringing Egypt back to the Arab world and you know what Egypt had done before that with Israel. Of course we were against the Israeli occupation of the Arab land and we supported our Arab brethren to liberate their occupied territories, but we did not stand against their diplomatic efforts to achieve whatever they could achieve. Q: July 17th, President Hussein appeared on television, and accused Kuwait of waging economic warfare. Why such a strong stand? Why threaten war? Aziz: Well, that was not the first time President Saddam Hussein spoke about a war being raged against Iraq. 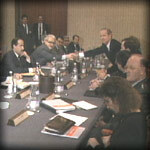 In the final session of the Arab summit, that was held late May 1990.... he said I would like to make a short statement. He said, "In the last few months, some Arab countries have increased their oil production superficially, without any economic reason. This has led to a drop in our revenues. Each dollar less in price means to us one billion in revenues for a year. We have fought a very long war, it was a very costly one and in this war we defended your security. If you do not mean waging a war against Iraq, please stop it." That was said clearly and in a very responsible and quiet manner in the presence of King Fahd, Sheik Jaber of Kuwait,Sheik Said of the Emirates and all the leaders of the Gulf including also, Mubarak and the other Arab leaders who attended that summit. Q: What did the Kuwaitis do? Aziz: They did nothing. And he asked King Fahd, to help end this silly game which was hurting Iraq very severely. and he sent the Deputy Prime Minister to King Fahd to urge him to arrange a limited summit between himself, I mean President Saddam Hussein, King Fahd, Sheik Said and Sheik Jaber in order to discuss this question of the over production by Kuwait and the Emirates. So, we did our best to to warn them in a friendly, brotherly, responsible manner that they were hurting Iraq very badly and we wanted them to stop, stop this game. Q: And by July 17th? Aziz: By July 17th, nothing had changed, nothing has changed The Kuwaitis acted in an arrogant, irresponsible provocative manner and that led to the deterioration of the situation. Q: When was the possibility of putting troops into Kuwait first discussed? Aziz: Kuwait never occurred in the mind of the leadership 'til the end of June 1990. We still hope that our efforts would succeed. The summit ended sometime the first half of June, the Deputy Prime Minister went to see King Fahd and he promised to do something, he didn't keep his promise. By the end of June we started to realise that there is a conspiracy against Iraq, a deliberate conspiracy against Iraq, by Kuwait, organised, devised by the United States. So when we came to that conclusion then we started thinking of how to react against the future aggressors on Iraq. Q: So this fallen oil price, it was really serious? Aziz: Of course. We were facing two options, either to stop servicing our debts and then being declared bankrupt in the international arena, by our debtors, or we were to stop living well... we were not in an extravagant mood you see, but country needs several billion dollars a year to buy food, medicine, spare parts, and to take into consideration that after 8 years of war, the people wanted a better living. So this was a real conspiracy against Iraq, a deliberate threat to the security and status of Iraq in the region and in the world. And for no reason, there was a difference between us about the borders, but the talks about them were very very quiet. It took us two years at that time to discuss details of the borders. But if it took a long period we didn't think of that as very very serious and threatening but the situation of flooding the market with a lot of oil and bringing about an economic collapse in Iraq was a serious threat. Q: You had no option? Aziz: I have always said that the decision we took in August 1990 was a defensive decision. Iraq did not need Kuwait. If we had Kuwait in our mind for takeover, we could have done that in the '70s....if you look at the political scene, regionally and internationally it allowed such things, more than it allowed in the '90s. In 1975--1976, the Syrians invaded Lebanon. There was no reaction. There was a lot of terrorist attacks, and revolutionary organisations, toppling regimes, changing Kings and Mayors and Presidents and we had a very strong relationship with the Soviet Union. But we didn't think of Kuwait because we don't need Kuwait. What we were thinking was creating a modern state in Iraq and a balance of power between us and Israel but we did not think of waging wars with Israel. But we thought that the Arabs and Iraq need to create a balance of power, because the balance of power is the only way to to achieve a reasonable peace. Q: What was your assessment of what America would do when you moved on Kuwait? Aziz: Our analysis was that it was foolish of Kuwait to threaten Iraq, if it was not pushed and backed by the United States. How could a tiny emirate like Kuwait challenge Iraq in that way, if it did not agree on that with a super power? Q: But then why did you go ahead knowing the Americans would fight a war? Aziz: We were expecting an Israeli aggression or an American aggression or both, during that period, regardless of whether we go to Kuwait or not. That was our analysis, that was our conviction, that the United States, after the weakening of the Soviet Union, when George Bush started to feel that he's the most powerful leader in the world. He decided to take over this region. He decided to put his hand on the oil reserves. He couldn't do that successfully fully without destroying Iraq and destroying the military power of Iraq and removing this nationalist, patriotic leadership. Q: So you knew from the beginning that America was likely to take action? Aziz: Yes, we had no illusions about that. We thought that attacking them in Kuwait would change the balance in our favor because Kuwait was still being used against us. Why not attack that which was being used against us? That could change the balance of power, at least slightly for our favor. The Americans started their preparations against Iraq since early 1990. In October 1989, I met with James Baker in Washington and I told him on behalf of my President that we would like to have good relations with the new Administration as we had with the previous one and I told him that we would like to cooperate with the United States in all fields. There was a difficulty concerning selling agricultural material to Iraq. He understood my position and decided to solve half of the problem, but in March 1990 they stopped their deal. They were upset by the statement made by my President in the summit in Amman, but my President was very analytic in that statement and he said that America is becoming the sole super power. Is America going to use that status in a civilised responsible manner for maintaining peace, security, justice in the world, or America is going to use it to act aggressively and arogantly against nations. When Bob Dole visited Iraq with a senatorial group in April 1990, the President was very clear then that we would like to have the best kind of relations with the United States. April Glaspie was present in that audience, I was present and they were very satisfied and made very, very positive reactions to his analysis and to his statements. But George Bush wanted to take over the region and be something special in the history of the United States. He wanted to be the strongest leader in the world, to take over the oil revenues, manipulate the international oil market and dominate the whole world. Q: How did you think taking Kuwait would help you with your struggle with George Bush? Aziz: First of all you have to punish those who are threatening you. This is normal in international conflicts, when you are sure that somebody is near to you and he is being used by others against you, you have to do something against him. Secondly we thought that being outside our country that might give us some advantages. That was the analysis at that time. But Kuwait was not our main objective--if we had Kuwait in our mind, we could have done it 15 years before. Q: Why did the President summon April Glaspie that day, and what do you remember about that meeting? Aziz: The President wanted to send a message to George Bush that we are not the enemies of the United States, we do not intend to threaten the interest of the United States or to threaten our neighbours. There was a crisis with Kuwait and we really wanted to solve it peacefully and during the meeting he received a call from President Mubarak. President Mubarak told him that he was in Kuwait and then in Saudia Arabia and he arranged a meeting between us and the Kuwaitis in Jeddah, and he informed her of that news in a happy manner. He told her, "Look, the good news, President Mubarak told us that he's arranging a meeting between us and Kuwait." So he hopefully wanted a peaceful settlement to that crisis and that was the message to the Americans. That was not the first message. On the 6th of August, after we went to Kuwait, he summoned the American Charge d'Affaires, Mr Wilson, I think his name, and he gave him a similar message, he told him, "Look I want you to convey to President Bush that I don't want a conflict with the United States", I would like to have good relations with the United States and I am ready to solve this problem by peaceful diplomatic means. Q: In April, what was your assessment of what the Americans would do--what was April Glaspie saying? Aziz: She didn't tell us anything strange. She didn't tell us in the sense that we concluded that the Americans will not retaliate. That was nonsense you see. It was nonsense to think that the Americans would not attack us. In the early hours of the 2nd of August, the whole apparatus of the leadership took precautions for an American speedy immediate retaliation. With the exception of me, as Foreign Minister, I had to stay in my office, the President and all the leadership apparatus was being repositioned..... a precaution from an American attack. So we had no illusions that the Americans will not retaliate against being in Kuwait because they knew that this was a conflict between the two of us-- Iraq and the United States. It was not actually a conflict between Iraq and Kuwait and in my meeting with Mr. Baker in Geneva, he said, "You have a problem with the international community". I said, "No, we have a problem with you. The representative of the international community, the Secretary General of the United Nations is not talking with me now, you are talking with me." Q: Was the plan for you to invade Saudi Arabia? Aziz: That was not the plan. We never thought of Kuwait before, so how could we think of Saudi Arabia? That was a big lie, used to justify the American build up in Saudi Arabia. Of course at that time it was very difficult for King Fahd to invite American troops. That was the first time in the Arab history to do something like that and so he had to tell his people that while we are being threatened we don't want to face the same fate of Kuwait and that was the justification and so they, they planned it in that way, sold it to the public opinion and Saudia Arabia and the region and the world, But that was not the reality, we didn't threaten Saudi Arabia. Q: When was the final decision [made] that the troops will go to Kuwait? Aziz:	When our delegation, headed by our Vice President, returned from Jeddah, on the 1st of August, telling us that the Kuwaitis were arrogant, and didn't show any sign of reconciliation. So we thought it was futile to wait. We held a meeting of the Revolution Command Council, and reached the conclusion that the diplomatic efforts have failed and we gave the green light to the military action. Q: And you thought America would go to war? When the troops were heading towards Kuwait, the security arrangements for an anticipated retaliation were immediately being taken. Q: Did you expect them to send millions of troops to Saudi Arabia? Aziz: No, I wouldn't say that we thought in every detail what they would do but we thought that there will be a retaliation and a serious one and America is a super power and very powerful military power in this region, with fleets and military bases. So we didn't have any illusions about the power, the seriousness of the American retaliation. Q: You thought Iraq could take on America? Aziz: We were pushed into a fatal struggle in the sense of a struggle in which your fate will be decided. You will either be hit inside your house and destroyed, economically and militarily. Or you go outside and attack the enemy in one of his bases. We had to do that, we had no choice, we had no other choice. Q: And during the build up of American troops in Saudi Arabia, was there discussion among the leadership of 'Let's make a deal, let's back down'? Aziz:	We were reviewing the situation all the time. Whenever there is a political or military development, we used to review the situation, but we didn't think that there will be a change in the strategy and tactics of George Bush and Margaret Thatcher. You know, at that time, until the resignation of Margaret Thatcher, she was telling everybody that 'we will attack Iraq even if Iraq withdraws from Kuwait,' you know that. She was asking for the dismantling of Iraqi armament even if Iraq withdraws from Kuwait, so what does that mean? It means first, that they will not go to United Nations to seek permission because mainly she and George Bush were talking about Article 51 of the UN Charter, which entitles them to support an ally, Kuwait, to attack Iraq and act against Iraq. That was the official position of both the United States and Britain. Secondly she was saying we must dismantle Iraq from its military power. How could that be done without destroying Iraq, without a war? You cannot dismantle the military power of a nation unless there is some sort of a war. As it happened in Japan, as it happened in Germany in the Second World War, you just don't do that by diplomatic means. Q:	What were you telling the leadership about the state of American public opinion? Did you think that because of Vietnam, perhaps they wouldn't fight? Aziz: No. We were watching the scene in the United States of course, we were interested in the mood in Congress and public opinion. But we knew as statesmen that in the end, the leaders will decide, and they had the capability of creating a pretext that will confuse the public opinion and the Congress and bring it to to to the position of the leaders. We did not bet on the United States to be accurate. We did not bet on the position of the government of the United States or the Congress or the people. Or the position of Britain. We bet on the Arab world to find a solution. We thought that the Arabs, fearing the fatal consequences, not on Iraq, but to them, would tell the world OK, you have done your part, but we would like to find a solution. 'Til November we hoped that we could do something with Saudi Arabia. The last undeclared initiative was made by King Hassan of Morocco. He tried to arrange a meeting for a summit between President Saddam Hussein and King Fahd. Q: Why did the Arabs not succeed? Aziz: It was America. America didn't want the the peaceful initiatives to succeed because George Bush decided to go to war. If you are seeking the truth about that period, you should have seen that the decision for war was finally taken in the meeting between George Bush and Margaret Thatcher when she was there in the States. And that was the decision of President Bush also. Aziz: This is very hypothetical. As I told you, Margaret Thatcher and George Bush spoke about dismantling Iraq's military power, even if Iraq withdraws from Kuwait, so what does that mean? It means some sort of a war, with or without Kuwait. Q:	When George Bush finally offered talks--initially in Baghdad and Washington, and then it became Geneva, I've heard stories that at that stage the Iraqi leadership were thinking, "Well, we've failed with the Arabs, maybe we're going to have to make a compromise." Then suddenly this news about a meeting between Iraq and the US-- What effect did this announcement have? Aziz: From the very beginning we thought that that was a public relations move and when I went to meet with James Baker, I hadn't the slightest idea that meeting would succeed. I knew that that was public relations. That he wanted to tell the Congress, "Look, to the end I tried to find a diplomatic settlement", so that he could get a few more votes. We didn't have any illusions about the military intentions of the United States. The United States was doing everything in the direction of a war. Q: Do you remember him handing you that letter? Describe that moment.. What did he do? Aziz: Well before I left Baghdad I was watching very closely American television and media and I had the impression that the latter which was being spoken about, was not a letter to build a diplomatic initiative--it's a letter of threat. I told my President that that was my anticipation and I told him that if I find that letter not being cordial and objective, I will return it to to Baker. Aziz: Yes, the President told me you can judge the situation and act. We started the meeting. He told me that he's carrying a letter from President Bush to President Saddam Hussein and he gave me the letter. I took the letter from him and I read it. I read it very carefully and then when I ended reading it, I told him --'look, Mr Secretary, this is not the kind of correspondence between two heads of State, this is a letter of threat and I cannot receive from you a letter of threat to my President,' and I returned it to him. He put it in the middle between us and I was told several years later when I went to Geneva and to the same hotel to stay there, the director who was an American, told me that the letter is still in his closet. Q: What did you tell them the Americans at that meeting? Aziz: Well, he started the threats, he said, "Look Minister, if you don't implement fully the UN Resolutions, we will attack you and you know that we are a very powerful country, and we will bring you back to the pre-industrial age and another leadership will decide the future of Iraq. My response was very cool. I told him Mr Secretary, Iraq is a very ancient nation, we have lived for six thousand years. I have no doubts that you are a very powerful nation, I have no doubts that you have a very strong military machine and you'll inflict on us heavy losses, but Iraq will survive and this leadership will decide the future of Iraq. Q: How did the meeting end, do you remember that? Aziz: Well, we wanted sincerely to explain our position to the Americans. At the beginning I told him, Mr Baker, it's good to have this meeting, but why didn't it happen in September, eh? It could have had a chance of success if it was held in September, why not October? Why now? Anyhow I'm going to explain our position to you fully. Wanting to make a public relations move, he was patient and listened to my long analysis and statements. Q: When that meeting finished, what were you feeling as a person? Aziz: I was not surprised because I didn't have any illusions when I left Baghdad that there would be a diplomatic opening. I went to my room in the hotel, because we agreed to talk to the press.And I told him , you can talk first to the press and I will follow you. So I went to my room and waited until he finished his press conference, and made some notes. I was told that George Bush was going to make a statement, I said I will speak after the President of the United States then that was conveyed to him in Washington. He said, "No, I will speak after Minister Aziz." The content of my statement was clear that there will be a war against Iraq, but I still explained to the world our position, that we wanted a comprehensive, peaceful solution to all the problems of the region. Why don't they listen to us, why do they focus on the occupation of Kuwait and ignore the occupation of the West Bank, of Gaza, the occupation of the Golan Heights, the injustices inflicted on the Arab nations for decades? Q: What was the mood as the deadline approached....the mood among the leadership, and, the President's mood? Aziz: I was trying to explain to my western interviewers in that period, I told them, in this region of ours, all monolithic religions appeared, Judaism, Christianity and Islam and the people of this region are real believers in God, because they carry the three religions to the world. They believe in God and in fatality you see, they believe that when there is a fate you have to face it whether you are going to win or to lose and you have to believe in God, you have to believe in yourself, you shouldn't panic from the powerful whether it's a person or a state. The general culture in this region when you go to war, this is what dominates your thinking and feelings. Q: Why didn't you compromise--the Americans thought you would go with a partical withdrawal, keep the oil field--why didn't you do that? Aziz: I cannot argue against that--maybe the French would have withdrawn, but the French had 10,000 troops, it doesn't make any significant change in the military balance. Maybe one or two Arab states would have stopped--it makes no difference. There was a decision by the sole super power and George Bush was in a political position to make the world do it. Because he did it, and if you want to judge events, in a logical manner, --I reached an agreement with Gorbachev in the middle of the war. The agreement was based on full withdrawal from Kuwait, etc., and Gorbachev declared that agreement and he told me that he is going to summon the Security Council of the United Nations and turn that agreement between us into a UN Resolution. George Bush didn't listen to him. He moved in the ground attack without listening to Gorbachev. Q:	But I spoke to James Baker who was on the phone at the same time, he says, "We were never never never going to accept a deal where Iraq didn't agree to all the UN Resolutions..."
Aziz: We agreed on the UN Resolutions, we agreed in the agreement between me and Gorbachev the first item was Iraq accepts Resolution 660...? Which was the first resolution about Kuwait. But they didn't care about what Gorbachev said and wanted, they went on. They didn't care about the way they attacked Iraq, there was no agreement among the coalition to do everything they did in Iraq, nobody cared how many sides were bombed, what was bombed, etc. And who could have stopped them? Nobody could have stopped them. So even with the break up of the coalition at that time, American and Britain could have gone ahead you see, with their war, depending on their own explanation and interpretation of Resolution 678 on Article 51 etc on the pretext and nobody would have told them 'stop'. Maybe people would have criticised them, but poor people criticising mighty nations cannot prevent such consequences. Q: We interviewed Gorbachev. He said, "Look, I kept trying to say, it's not enough to say 'you get out of Kuwait', you've got to agree to pay the compensation, you've got to agree that sanctions will continue until you are fully out", all these things, because the Americans wanted to keep the pressure on. Didn't you realise by then that you had to just back down totally? Aziz:	I don't want to speak in a harsh manner against a statesman like Mr Gorbachev, but Gorbachev is not saying the truth. Read his statement--why he made a statement, he said 'I reached an agreement with the Foreign Minister of Iraq who represents the Iraqi leadership on the following points: First, Iraq will withdraw from Kuwait within three weeks, Second, the withdrawal from the City of Kuwait will be in four days. Third, an exchange of prisoners of war will be finished within three or four days. There will be a comprehensive cease fire and in the air and the sea and the ground. Sanctions will be lifted, etc. It is a document. It was published in the Soviet media, it was published everywhere, so why should he add things that he did not put on that agreement? Q:	No, he accepts that agreement and he tried to sell it to Bush. He rang Bush and Bush said, "Look, there still is not the full acceptance of every single UN Resolution". Aziz: Well that was polemics you see because the main resolution was accepting the sovereignty of Kuwait and withdrawing from Kuwait, that was the main resolution. The other resolutions could have been discussed because the other resolutions were built on this first resolution, so you cannot say that you have to accept them all officially because some of them will drop automatically if you accept the first resolution. But the main thing was achieving first a cease fire. Then.... Bush could have said OK, let us have a cease fire and then discuss the other matters. He did not accept the cease fire, he continued the war. According to his own schedule he didn't care about what Gorbachev said and at least with me he had a schedule. When he reached the end of that schedule he ended the war. Aziz: Yes.. that was a disappointment because I had hope that it might work. I returned from Moscow from Amman, I met the king and the queen and they were waiting for me and I told them what I had done in Moscow, the agreement I reached with President Gorbachev and they were very happy and hopeful that this will end the war then there will be a cease fire. I went to Baghdad after that, when I woke up to head towards Baghdad I saw Cheney on the CNN in the Royal Guest House that the ground attack had already started, so that was a great disappointment. I thought that Gorbachev, well, the Soviet Union was weaker than it was before but it was still a super power, a permanent member in the Security Council. I thought that he would use his influence to make Bush accept that agreement. What is important about the position of Gorbachev, --when I reached an agreement with him, he couldn't sell it to George Bush, but, a month later when the Americans presented the draft of Resolution of 678 which added more and more conditions on Iraq, the Soviet Union voted for it, without hesitation which means that the position of Gorbachev was not a position you can rely on, eh? He could have said, 'as a matter of principle, we had conditions on Iraq, Iraq during the conflict accepted those conditions so we don't have to add more conditions, it was you who did not accept the cease fire. You decided to continue the war for several days more. Why are you adding more conditions?' He didn't say that. He just endorsed the American draft resolution as it is. Maybe some minor modifications. We got told later that the Americans insisted that Iraq would not obtain any missile beyond 50km. Q: Gorbachev needed the Americans? Aziz: Yes, so when he says that he wanted things from Iraq and Iraq did not listen to him, that does not correspond to the real facts. Q:	During the air war, they didn't just bomb two sites, they bombed , everywhere they thought President Hussein was. Aziz:	Well... this is history and Hussein's family is going to tell the Americans how the President lived. For they have defected, they are American spies and they will tell everything, so I am not going to reveal any secret. The President lived very quietly, very normally during that period. As for me, I did not work in the same building of the Foreign Ministry. I chose another building, and used to go early in the morning to my office, then return to where I was living with my family, have lunch, rest, go back to the new headquarters, do my job and by the end of the night go back to my family, have dinner, sometimes a drink in that cold weather, smoke my cigar. Aziz: And the President was doing the same with the exception of having a drink, he doesn't drink, he's a Muslim. But he didn't spend his time underground. He was most of the time in Baghdad. When he left Baghdad he went to the front to see the military situation. He was in good mood, very quiet thinking very serenely about the situation, having regular meetings with the Revolution Command Council, and with the military leadership. We had several several meetings at that period, just in the city of Baghdad, not in bunkers, not in tunnels. In the city of Baghdad. Q: What was the calculation in firing the Scud missiles at Israel? Aziz:	Well, Israel was part and parcel of the military aggression against Iraq. They did not participate directly, openly, but they provided all support to the aggression against Iraq so. Q: Did you hope to provoke them into retaliating to split off the Arab zone? Aziz:	No, we didn't think that they will do anything in the sense of ground attack because if they have to fight on the ground, they have to cross Jordan. That makes it difficult for them, that's another complication. And having a ground confrontation with Iraq--the Americans avoided that. Had Israel entered a ground confrontation with the Iraqi troops, the results of the conflict would have been different. Q: So why do it then...a gesture of defiance? Aziz: Well, when you are attacked by an enemy, you attack your enemies, that's natural eh? Israel acted as an enemy to Iraq at that time. It participated fully, first of all in the preparation of the war in urging George Bush and the United Kingdom to destroy Iraq by all means and we know and time will prove that er, Israel provided many many logistics, you see to the preparation of the war, before the war and during the war, so why don't you hit them if you can? We had the capability, we did it and it was not a surprise. If you go back to my press conference in Geneva, I was asked this question, 'are you going to attack Israel if you are attacked by the Americans?' My answer was "Absolutely--yes." Q: And when was the decision taken to fire the Scuds? Aziz: It was taken by the leadership that when they started attacking us, we will attack Saudi Arabia and we will attack Israel and of course the American troops, so we didn't need a meeting to say, 'go ahead', it was left to the military leadership to act upon the instructions which were made before the war. Q: Why did the planes go [to] Iran? Had you fixed a deal with them--to take the planes? Aziz: No, there are two kinds of planes. The transportation planes were sent to Iran before the war, and that was a deal, we asked them to send the transport planes, the civilian and the military transport planes to Iran and they said OK, we will keep them for you. The.. military planes were sent without their knowledge, we didn't have enough time. The President made the instructions that whoever can cross to Iran to keep his plane safe do it and tell the Iranians when you are in the Iranian air space. The reason was that during the war they started attacking our airplanes but they couldn't make a lot of damage because of the shelters we had but during the war, they got information from a Yugoslav firm, about what kind of a shelter it was and they changed their munition which they were using and they started attacking the planes, shelters and destroying them. So we thought that we could save planes by sending them to Iran. Q: Why were the oil wells in Kuwait ignited? Aziz:	Well the attacks on oil industry were started by the Americans. The Americans attacked our oil industry from the north to the south. They attacked oil fields, stores, refineries. So when you are at war, when your enemy is using anything in his power to destroy your capabilities, you just retaliate. Q: Why didn't you use your chemical weapons? Aziz: Well, we didn't think it wise to use them. Q: Can you tell me in more detail....? Aziz: That's all I can say. It was not wise to use such kind of weapons in such kind of war, with such an enemy. Q: Because they had nuclear weapons? Q: The Americans ended the war. They had taken back Kuwait, they captured sixty to eighty thousand of your troops. Were you surprised they called a ceasefire? Aziz:	No, I think that was the end because if they decided to go ahead on the ground assault against Iraq, then the results will be quite different from what really happened. They tried to avoid man to man conflict..
Q: Were you expecting them to go to Baghdad? Aziz: We would have laughed if they had decided to come to Baghdad because the results would have become quite different. Q: You're a professional diplomat, admired even by many of the people you have mentioned today, who've dealt with you. As a professional diplomat, analyze for me, where did the Americans go wrong in the end? Q: It was a huge defeat, how come you're still here, how come the President is still intact? Aziz: Go back to my meeting with Baker, he said another leadership is going to decide Iraq, I told him you are wrong, in our region, when a leadership fights against the Americans, it politically survives. It's not a wrong-doing you see, in the eyes of the Iraqi people, to have a conflict with Israel, or the United States, because of history of this region. You can remember what happened to Nasser when he was defeated in 1967, he resigned then, then the the people returned him to power. That's why we stayed because we are part of our nation, we have deep rules in this land. Nobody brought us to power so that he could move us from power, we came to power through revolution, we stayed in power because we are on good terms with our people, and that's it. And all the damages of the war, the very bitter and painful repercussions of sanctions -- it's not only the regime that survived, it is the State that has survived. Q: And the uprisings were you surprised the Americans didn't intervene to help...? Aziz: No, the uprising was a surprise to them, it was not part of their plan, it was not their own you see. It was an Iranian plan. The Iranians devised and pushed for that so called uprising which was a very chaotic one, a very primitive and savage act of violence against, not only the regime, it was against the people, against civilian and state property. It didn't live because it didn't have strong roots in the Iraqi society. The Iraqi society is not the society that destroys itself in an endeavour to change the regime. We changed the previous regime, we did not destroy Iraq because we wanted to remove the the then President. In 1963, we participated in a revolution. It was a wild and bloody one, but we wanted to keep the State as it is, because we will be the leaders of that State when we win. What those people did in the south of Iraq, they burned everything, they destroyed everything, they killed whoever they reached and that is not the behaviour of a person or a political group that's going to hold power. That was the behavior of a number of people who hated Iraq, who wanted to destroy Iraq, who wanted to revenge their defeat in front of Iraq in the moment of weakness of Iraq. Therefore it took us only few days to recover from the surprise, to reorganise our troops, our resources and to impose peace and order in the Southern governors. It took two weeks to do that. Q: Wasn't this whole saga, a huge mistake for Iraq and here we are five years later and still sanctions? Wasn't it a huge miscalculation? Aziz: Iraq had no choice but to act as it acted on the 2nd of August 1990. Either to be destroyed, to be suffocated and strangled inside its territory, or attack the enemy in the outside. That was the calculation, and I think it was a correct one. Correct in the sense that you had no other options. Aziz: Well that was the propaganda machine which the Americans used to justify their policy in the in the region. It is not true. Q: Why do you think they fought you? Aziz: To take over the most strategic region left in the world. It was a big prize, the Americans wanted to achieve it since the time of Roosevelt. You remember the story that when Roosevelt was told about the oil revenues in Saudi Arabia etc and how important was that to America and to the world and he was asked by one of his advisors, 'How much do you want of the Saudi oil?' He said, "All of it". Q:	Who won this conflict? Aziz: Well... this is still an historic process which has not reached an end. But in the end, of course Iraq suffered great losses, but in the end my analysis--not as a diplomat but as a writer, as an analyst--in the long run when I use the term 'long', it is not very long term, America will lose in this region and I have a final conclusion which to me is very clear, that the allies of America in this region who participated in the war against Iraq, politically, militarily, economically are nowpolitically weaker than they were in 1990, economically than they were in 1990 and their future is not secure as it was in 1990. So the allies of America in the region are not in good shape. They were in better shape in 1990. In the long run, a few years from now, this will lead to such developments that will be very negative to an America which cannot wage a similar war that it waged in 1991 against Iraq. Q: The Kurds rose up, and America did eventually intervene there and you backed off, why? Q: Surely you backed off because the Americans were putting troops there? Aziz: No -- no. The American troops entered only in some parts not all over Kurdistan. They imposed a no-fly zone but we withdrew our forces and we withdrew our administration because the Kurds, the two major Kurdish parties were making skirmishes with our army, with our police, with our security, with our administration. We decided that enough is enough we don't have to go to a bloody conflict with our people. Let them do whatever they like for a while, it might take months or years, but in the end they will come back to their homeland because they will realise that there is no other option for them except to be part of the state of Iraq. Q: And Khafji..? I read that the purpose of the attack on Khafji was to take prisoners to use as hostages--true? Aziz: No, the purpose was to have a direct contact with the other side on the ground . We were waiting for them to come but they came late when they inflicted on us a lot of casualties and especially in the civilian area, so it was a an attack an offensive in which we tried to make what you call in Arabic -- a touch you see between the two armies, but they avoided that. Q: You wanted to see if you could inflict some casualties, a little like in Vietnam? Aziz: Yes... but they withdrew from Khafji, it was almost vacant, they used the Air Force and we had to withdraw our tanks and people from there, otherwise they would be eliminated. There was no person to fight. Only a few Arabs and that was not significant to stay there to continue. Q: For the record, what was the closest they came to killing President Hussein? Aziz: The Americans don't know Iraq. They don't know President Saddam Hussein, they don't know how we think, how we act you see. Therefore they failed and they will fail. Even with the new information they will get from those two defectors, they will not succeed in doing anything against the President, because we have our own means and ways to protect our President and ourselves from the enemies. Q: In August or July 1990, if George Bush had said, 'Do not invade Kuwait or we will fight you', what would you have done? Aziz: We would have told him, tell the Kuwaitis to stop threatening Iraq, to stop their wrong policies, deliberate wrong policies against Iraq and we will not go to Kuwait, very, very simple. Q: And if they didn't stop? Aziz: That means that the war has already started and you have to act. Q: You've talked about fatalism. You seem almost to have thrown your hands up and just drifted towards this war. Aziz: No, we are good fighters when we decide to fight, even when we lose, but we have proved to be good fighters and we have proved to be good statesman and we have proved to be good builders as well. Q: Did you fight this war because in the end to back down would have been too humiliating for the Iraqi people, that it was a war fought for pride? Aziz: No I don't think....the Iraqi people have a long history and they have trust and love for a bold leader who leads them but they want that bold leader to be wise as well, and when any leader including Saddam Hussein acts in a wise manner that serves the protection of the country and the welfare of the country, they will understand the reasons of his decision, so it was not a psychological reason that we did this. Our analysis was that it was imminent, they wanted to destroy Iraq. Q: The uprisings were put down with a great loss of life, I know there was savagery on that side, but there was savagery by your troops as well. Was it necessary to put down the uprising with so much bloodshed? Aziz:	Well there was a savage uprising against not only the government but against the Iraqi society. You have to act in such circumstances, you have to act. Every nation will act in such circumstances. When the Southerners in the United States revolted against the central government, they had a bloody war for four years and many many people were killed in that war. The President of the United States at that time, Abraham Lincoln, didn't count casualties, he wanted to reunite his nation. When you have a bloody uprising, a savage uprising in Northern Ireland, you will act and you will send troops and you have to fire and kill if you need, but we had to do that, because they were killing people, they were destroying schools, looting hospitals, destroying every government building, killing whoever they hated etc etc and what, what would you do in such circumstances. You have to use force to regain control, impose order, that's what we did. It took us two weeks. Q: The Americans wonder if they had carried the war on for another 24 hours, whether they would cut off more of the Republican Guard and it would have been more difficult for you to put down the uprisings. Is that true? Aziz: Well if the Americans had entered inside Iraq they would have faced the Iraqi army. The Republican Guard is an army which fights and kills when it is man to man conflict, when it is a man to man touch between two armies, they kill, so they avoided casualties in their troops, by taking that decision. It is not a favor to Iraq, they were not kind to us, they did not love us to stay in power, it was quite clear that they wanted to avoid casualties because George Bush entered that adventure, promising the American people that it would not be another Vietnam. And he kept his promise, very efficiently, by limiting the war, mainly to airplanes and missiles. Q: Well there was a land war, it lasted three days, and took 80,000 prisoners. Aziz:	Yes, but that was after the preparations made by the air attack. It was not a a conventional war you see between two armies. Aziz: The Republican Guard fought against them very well and they knew that. They knew that it was not easy to fight against well equipped, trained Iraqi troops.